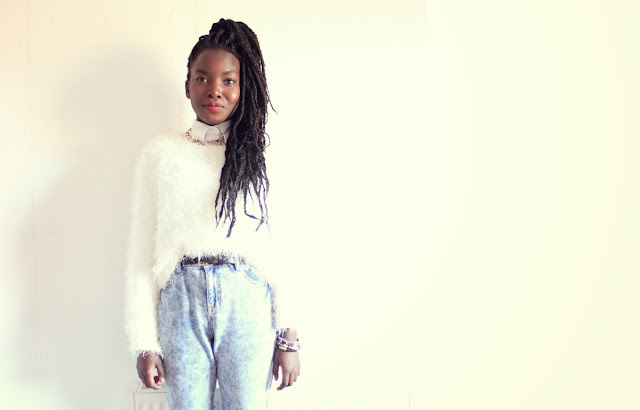 Hey dolls , I've decided to start a new segment on the blog called my favourite college look of the week! Basically my entire life i've been wearing uniforms minusing weekends and school holidays I might as well have been born in one. So whilst I was in school, college to me seemed like the greatest thing known to man not because it meant you were no longer a kid, or you were free from school why? because you weren't required to wear the same horrid clothes as everyone else that you basically knew! I even remember being mesmorised by american t.v shows and movies where kids got to express their style and be fashionable every single day and the worst part about it was those kids didn't even seem grateful no, they just pranced around on screen in their bedazzled flared jeans and skirt-over-trousers combo's (which was THE trend at the time) whilst I withered dreading the morning. So now that i've finally reached college hurrah I thought It would be wrong of me to find a way of celebrating my new found freedom which sparked the idea of showing you guys my #FCL's of the week (though I might be changing the name to something cooler & btw the hashtag doesn't serve a particular purpose I just think everything looks cooler with a hashtag introducing it am I right or am I right!) This way i'm celebrating my freedom by showing you guys my uniform free looks and Its also a way of forcing me to blog at least once a week because I seriously need to get my life! (any tamartians in the building) aha. I've seriously fallen in love with tamar braxton you guys its not even a joke and omgg Is anyone watching made in chealsea??!! Ok i'm going to stop now because this won't end today once I start talking about my shows but if you do watch then, comment what your thinking because I literally live for monday's nowadays! Haha. I understand that feeling. Its the same over here in Nigeria, we get to wear uniforms for at least the first 12years of our life. Omg... Yes just ... Yes. You look incredible!! Wow..
love your jeans! and that jumper is so cute and fluffy, omg made in chelsea dont even get me started, i need to catch up properly with this season though! You look amazing, I love the jeans, thought they were Topshop rather than New Look! This is a perfect college outfit, I remember being so excited to be able to wear my own clothes at college too. Oh don't get me started on MIC, I love to hate Phoebe and Spencer! Great outfit. I love the fluffy jumper! Loving this vintage kind of look! Especially the jeans. Love this look and love your hair even more! 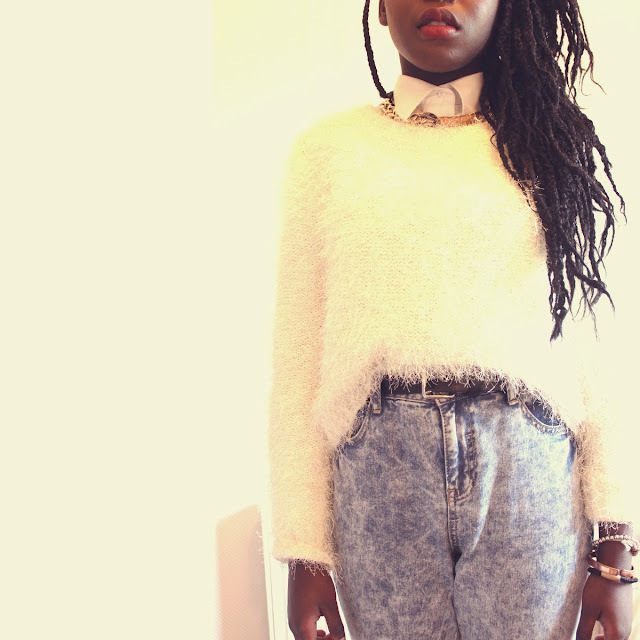 Visit my blog if you have time, I've just posted a new outfit and I'll be happy to read your opinion! 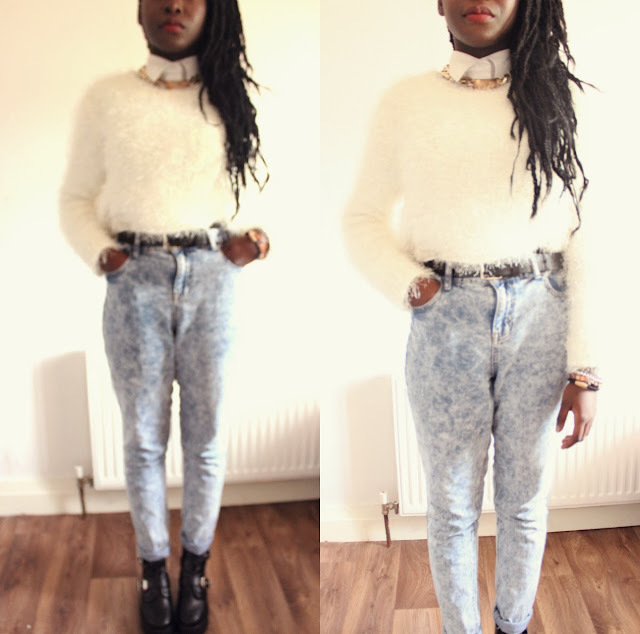 Great to see someone style a fluffy jumper differently, you look awesome. I'm loving these fluffy jumpers! Thanks so much for your lovely comment on my blog, hope to read you again. Your style is INCREDIBLE!! !Love your fuzzy bunny sweater! Soooo COOOL! and you have the best hair! Ps. We're doing an Isabel Marant for H&M Giveaway on our blog! Check it out! Ooh :p Love that furry sweater and the plaid suit few post back are so beautiful ! Beautiful furry sweater and the plaid suit few posts back is so nice ! You look absolutely amazing and you are so beautiful! I love your blog. I really really love this! You look great!